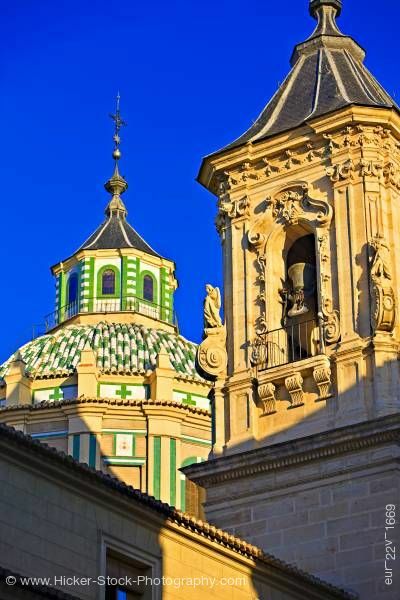 Stock photo of a close up of the Bell Tower and Dome of the Basilica San Juan de Dios (church), City of Granada, Province of Granada, Andalusia, Spain, Europe. The view shows a close up of the bell tower and dome of the Basilica San Juan de Dios church. This stock photo shows Bell Tower and Dome of the Basilica San Juan de Dios (church), City of Granada, Province of Granada, Andalusia, Spain, Europe. The bell tower is ornate with the three corbels under an iron gate of the detailed archway of the bell. Statues stand on more corbels on each corner of the tower. Pilasters with decorative caps and above an equally decorate cornice. The tower’s roof is black. The round dome in the background is decorative with green and white trim on the stone. Arch windows, pilasters, and roof shingles stand out with the green and white. A cross sits atop of the dome. A clear blue sky is a wonderful contrast to the two elegant structures. Bell Tower and Dome of the Basilica San Juan de Dios (church), City of Granada, Province of Granada, Andalusia (Andalucia), Spain, Europe.